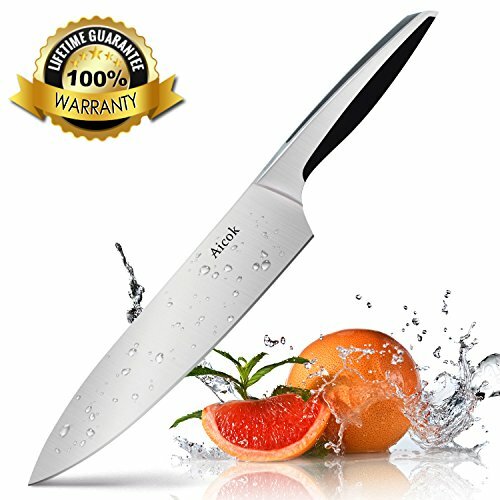 Aicok knives are characterized by high-quality forged blades, which are made of German stainless steel. Each blade is forged from a single piece of steel, which ensures outstanding strength and prevents from absorption and discoloration. Ideal for all of your basic kitchen cutting needs. (Material number 1.4116, a martenistic stainless steel). It contains 0.45 to 0.55% carbon, 14 to 15% chromium, 0.5 to 0.8% molybdenum and 0.1 to 0.2% vanadium. The purpose of alloying molybdenum is to increase the pitting resistance of the material.